The BK10 is a mounting bracket to put for example a mobile antenna on a balcony. This support agree to the antenna sockets standard PL (UHF male) or plug N and can be mounted directly on a balcony railing with a diameter of 25 to 64mm. The spacing from the blacon is about 15cm, and the maximum size of the recommended antenna for wind resistence is 180cm. The balcony railing bracket BK10 has two fixing lugs, so that the antenna can be mounted vertically or horizontally. Delivered with the support only. Optional: PL base with coaxial cable (see accessories). 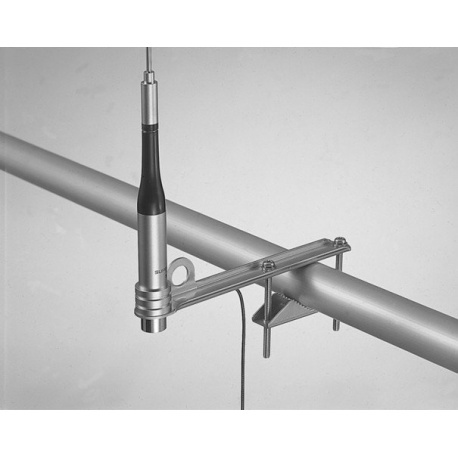 Description: The BK10 is a mounting bracket to put for example a mobile antenna on a balcony. This support agree to the antenna sockets standard PL (UHF male) or plug N and can be mounted directly on a balcony railing with a diameter of 25 to 64mm. The spacing from the blacon is about 15cm, and the maximum size of the recommended antenna for wind resistence is 180cm. The balcony railing bracket BK10 has two fixing lugs, so that the antenna can be mounted vertically or horizontally. Delivered with the support only . Optional: PL base with coaxial cable (see accessories).